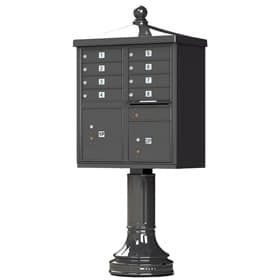 Add some flair to your commercial outdoor pedestal mailboxes with 8 door cluster mailbox accessories. 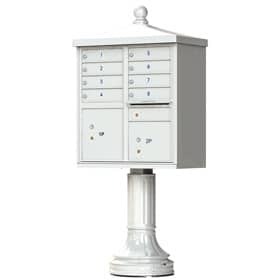 The traditional Florence Vogue accessories kit includes a CBU roof cap with ball finial plus a rounded post column and stylish post base. These decorative 8 door cluster mailbox accessories by Auth Florence Manufacturing require little assembly, no design modifications, and are designed for use on USPS approved CBU mailboxes. Solid die cast aluminum construction by Florence Manufacturing snaps together for quick install using supplied set screws. Roof Cap sits on top of CBU mailbox and ball finial screws into place. 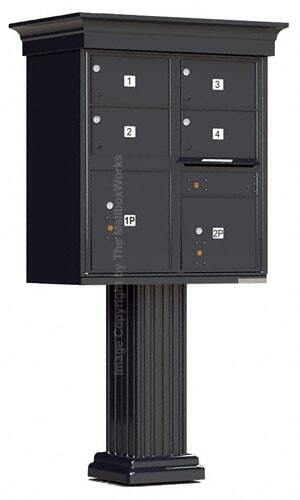 Post Column and base are designed to wrap around both pedestal and base that come with the CBU mailbox unit. Traditional Florence Vogue accessories come in Auth Florence’s four architectural colors featuring a rust-proof powder coat finish. 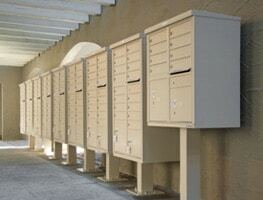 USPS only purchases Auth Florence cluster Commercial Mailboxes, which offers the highest levels of security and reliability. 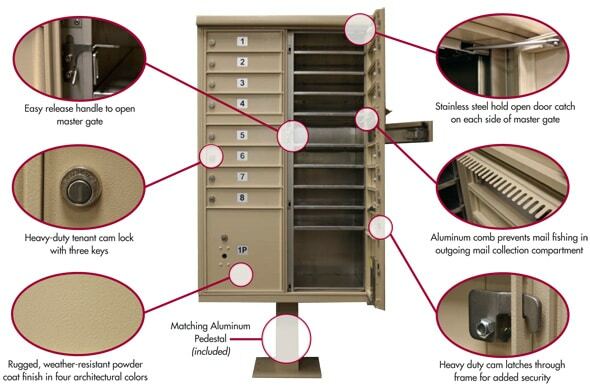 Secure design features include heavy-duty 5 pin tenant cam locks, interlocking seams that overlap to prevent prying, a stainless steel hold-open door, heavy-duty cam latches and aluminum comb to prevent mail fishing through outgoing mail. 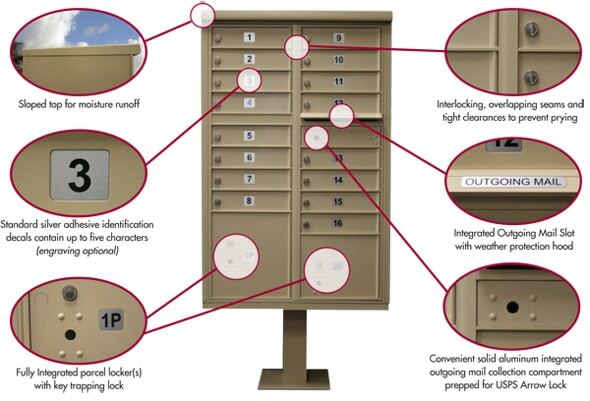 Each CBU mailbox kit includes 8 standard size tenant compartments, 2 fully integrated parcel lockers with key-trapping USPS approved locks and 1 fully integrated outgoing mail slot. 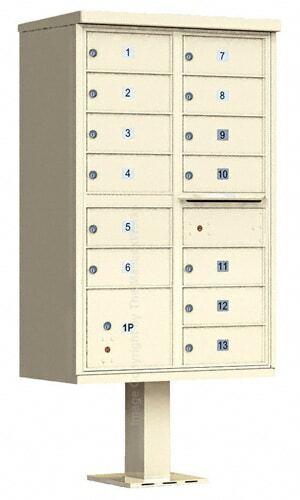 CBU commercial mailbox units feature rust-proof powder coat finish that is both attractive and withstands force and harsh weather. 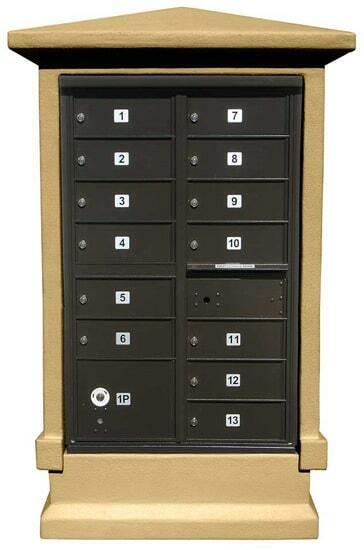 Choose from 6 designer colors and custom tenant door engraving options. 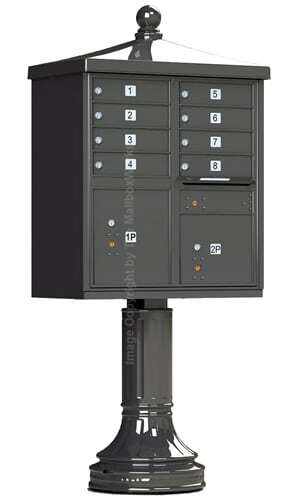 Ask us about quantity discounts on orders of multiple CBU mailboxes. 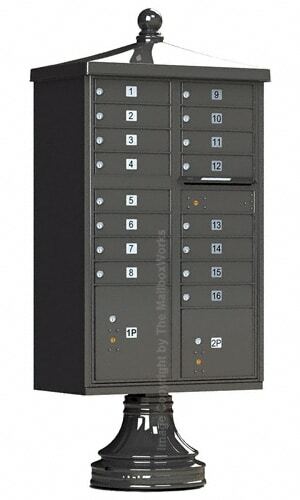 Let us help you with your 8 door cluster mailbox purchase, including the Traditional Florence Vogue accessories kit for your new CBU mailboxes.